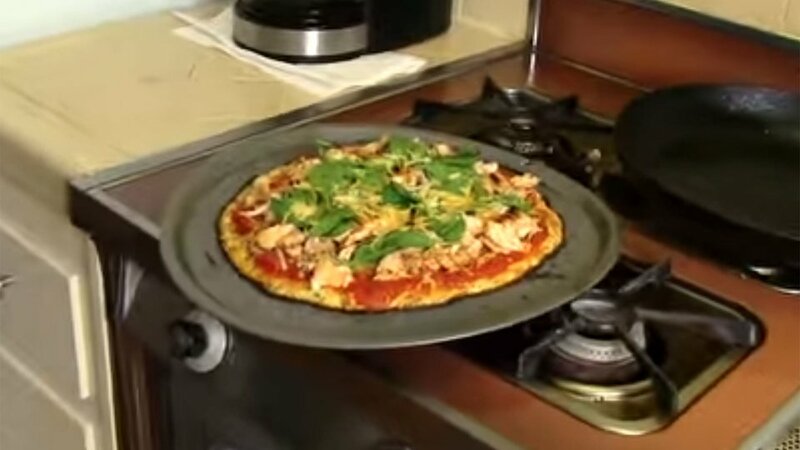 With a crust made from cauliflower and toppings like barbecue chicken, spinach, and egg, this just may be the healthiest pizza recipe in—wait for it—the world. No hyperbole there, dudes and girls. OK, maybe a little. So here's a compromise: It's probably the most delicious healthy pizza you'll ever eat! Use a knife to cut and scrape florets from a head of cauliflower. Place the cauliflower in a food processor or blender and pulse until it has a texture like rice. Measure 2 packed cups, and pour into a mixing bowl. Add two eggs, 1/2 cup cheese, and a dash of parsley and oregano to the cauliflower. Mix together with a fork until it takes a dough-like consistency. Add cooking spray to a pizza pan and add cauliflower dough. Pat into a pizza shape approximately 10-12 inches across. Bake for 15-20 minutes, until it is completely cooked and golden brown. Add sauce, a light layer of additional cheese (optional), chicken, spinach, and any other ingredients you desire. Put back in the oven for 3-10 minutes, or until the cheese is melted. Keep an eye on it so it doesn't burn!